sunshine and whimsy. : on my wish list. + Method Daily Shower Cleaner | Probably the most boring item on the list, but I've been thinking a lot about being "greener" with my choices. This isn't perfect, but it's better than what's under my cupboards right now. And although Target now ships internationally(! ), I'll probably order this on iHerb. + Pixi Glow Tonic | I've heard good things about this! + A Beautiful Mess Ink | I'm gonna need an ink pad because this month's Happy Mail includes a fun stamp! + Seoul Little Hashtag Necklace | So dainty, so cute, so fun! + Herbivore Blue Tansy Mask | I've heard great things about this company and just discovered they ship internationally! Brandy recommended this to me and I'm excited to try it. 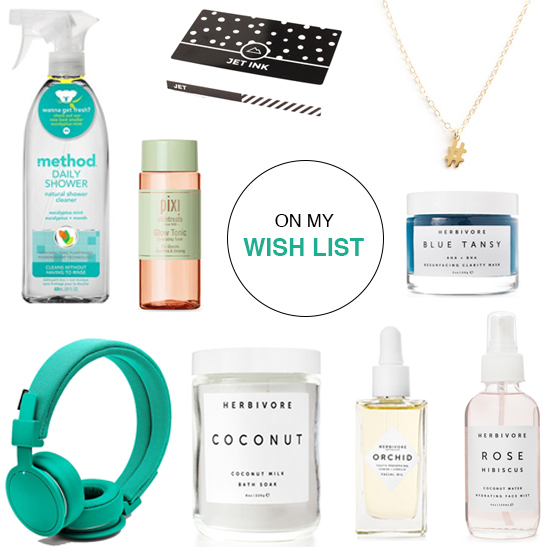 + Herbivore Rose Hibiscus Hydrating Face Mist | It feels like I've seen this face mist everywhere. + Herbivore Orchid Facial Oil | My skin has been better since I've started using coconut oil, so I've been curious about facial oils. Sarah recommended this and Anna's obsessed with it. + Herbivore Coconut Soak | I promise I'm not sponsored by Herbivore. I've just heard many, many good things about their products. + Urbanears Plattan ADV Wireless Headphones | I won't be buying these because I already got a pair of Urbanears headphones for Christmas, but I love this new colour! It seems I do a lot of online shopping when I'm in smalltown China ;) But the only things I ordered from this list are the Herbivore face mask, mist, and oil! Not too bad.